Hotel Central Park terletak di kawasan perumahan yang tenang di daerah Oud Zuid, hanya 100 meter di pinggir Vondelpark. WiFi percuma disediakan di hotel ini. Bilik-bilik berhawa dingin di Central Park mempunyai TV kabel skrin rata, meja kerja serta alat membuat teh dan kopi. Ia juga mendapat faedah daripada bilik mandi peribadi dengan pancuran mandian dan alat pengering rambut. Central Park Hotel berjarak 300 meter dari hentian trem Amstelveenseweg yang menawarkan sambungan terus ke Museumplein dan Stesen Kereta Api Amsterdam Central. P.C. Hooftstraat yang eksklusif terletak sejauh 20 minit berjalan kaki. Please note that smoking is not allowed in the hotel rooms. We had a wonderful stay in Amsterdam and as well in this hotel. The stuff was nice and always there for any questions. Breakfast buffet was delicious and the room was quite nice! Would definetly visit it again! The hotel is sitting in a quite neighborhood where just walk 3 mins to main road with tram available. There are parks/lake/open market and mini mart nearby. I would love to stay here again for next vacation to Europe. Location. Value for money. On street parking. Great stay, it was my 3rd time back there. It's near the park and away from the tourist strips. And there's heaps of cool restaurants and bars around the corner. 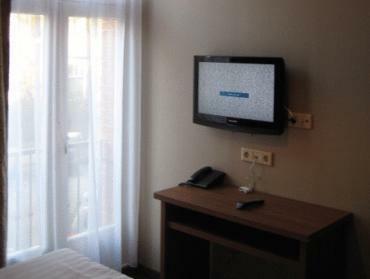 Rooms are quite small, but it's Amsterdam, get out of the room and check the area out. Location to vondel park. Nice room. Decent price. Good stay. Smallish rooms. 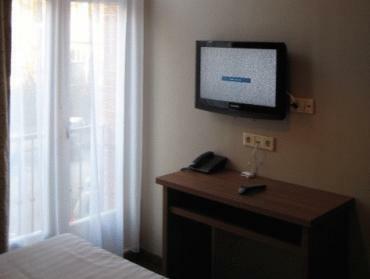 Close to vondel park and a few minutes walk to some great restaurants. And there's not hoards of tourists walking around outside. Very peaceful and quiet. I was surprised at how far from the city center the Hotel was, It was also very hard to find the Hotel at first as its hidden down a side street near the very end of Vondel Park. The best thing to do would be to hire a bike from the hotel and bike all the way through vondel park to the center, then park/lock up and explore. I would not walk the distance, you can get a tram into the center but biking through the park is nice. The hotel staff are ok, not super friendly but do the job right. The rooms are fair size but my room had a crack line on the window overlooking the street. Never had food there There are some nice bars and eating places around the area, just head to the main street and walk down. Good, it takes 20 minutes with the tram but the location is very nice and the hotel was clean, small but nice rooms and they put an extra Bedford our baby. very enjoyable, nice view, near a small park, view of park and old Amshterdam,, near shops that sell stuff like food which is always handy when you are a human. Good value but obviously not a four star hotel as is reflected in price. Some people may struggle with the shower flooding the bathroom but i thought it was quite fun as a broom-handle squeedgie is supplied which makes light work of the puddle. 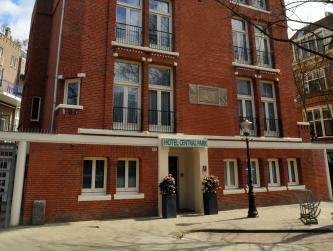 Great location next to Vondelpark and just a few minutes walk to tram stop. Also great bus service to Airport. Room was tiny with twin beds pushed together and the smallest bathroom I've ever seen in a hotel. Also heater needs to be on full time or room gets very cold fast. But good hotel for the price you are paying and neighbourhood is very nice. I really liked this hotel, it was just 10-15 min with tram from central staition, and not so touristic part. Stake house on amsterstreet is highly recomended, good food and nice staff. I would definetltly choose this hotel again if i stay in Amsterdam. Close to Museumplein and very quiet and cosy area. 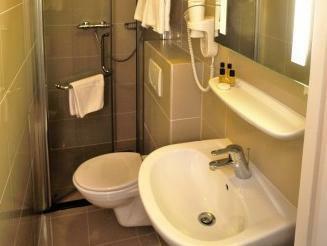 Very clean, but the rooms are relativelly small. it is good hotel but abit dificult to find. the hotel is near the park which you can enjoy and relax. from hotel to central can take tram which take about 20 minutes. the room quite small. there is no breakfast provided. If you care to get a little insight about how the locals live, this is the place. Convenient enough though to transport and services. Central Park Hotel Amsterdam is a small but nice and lovely hotel. The staffs from reception from house keeping ladies are all kindness to help us.